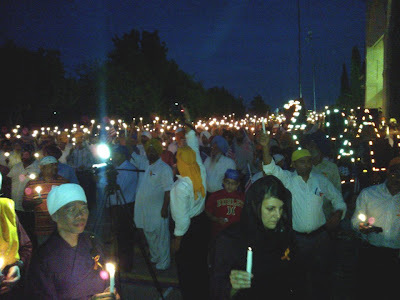 The massacre of Sikhs at the Gurudwara in Oak Creek, Wisconsin shook the world. No one would have expected this to happen in a suburb of Milwaukee, Wisconsin. A deranged individual with hatred walked in to the Gurudwara and opened the fire killing 6 and wounding several. One of the great outcomes of this tragedy is the sacrifice made by Police and Fire men around the world, and most certainly in Wisconsin. The looney gunman Wade Michael Page shot the police officer multiple times, when the other officers rushed to him, he waved them to go inside and take care of the wounded and injured. It’s a tender moment and a moment to salute our officers. When I read it for the first time, I was a cry baby! Mr. Manmohan Singh, secretary of the Temple acknowledged that in his opening remarks in Punjabi, and I fully understood it and the Punjabi language took me back some 16 years ago, when I was in the Gurudwara shooting for my TV show, and interviewing Gyaniji (Clergy) - the whole interview was in two languages- I was speaking in Hindi/Urdu and he was speaking in Punjabi, the conversation was going on intensely until he used a word that I did not understand, it was an awakening. We paused and learned that we were speaking in two different languages, and yet we understood it, but not all of it. We laughed it at that time. And today, I understood the speech of Mr. Manmohan Singh in Punjabi, even though, formally I don't know the language. It is one of the shortest Ceremonies, after the Kirtans (Bhajans/Hymns) singing, Mr. Singh took to the microphone and spoke, peace was emanating from his face and his language. Blessed are the peace makers, said Jesus some 2000 years ago, meaning those whose language and actions bring peace and not conflicts, Prophet Muhammad’s whole life was example of mitigating conflicts and nurturing goodwill, Jesus described it as turning the other cheek, meaning not aggravating the conflict, but finding a solution. Guru Nanak, the fountain head of the Sikh faith was committed to bring peace between different people at that time, indeed, Sikhism started out as an interfaith movement; its basis is Seva, service to humanity. Manmohan Singh's speech was thoughtful, expressing love and understanding, instead of the typical condemnations, I admired him for that. People did walk out with a sense of support and a sense of unity rather than rage at the evil man, that was a remarkable speech and I thank Mr. Manmohan Singh for the same. The sanctuary was full, people were standing… I must guess that at least a 800 people attended the event. Everyone came from different walks of life. I will link some of the stories here. The positive point about the event was the support that all communities expressed in standing up with fellow members of the family of faiths. They kept the proceeding short and sweet, some of us were to speak, I am glad they moved without all of us. My role was to speak briefly and acknowledge my Wicca and Native American friends who had joined us. Part of my speech would have been, “As an American, Indian and a Muslim, I stand by the Sikh community and hope to find sustainable solutions to prevent shameless events like this from happening. As Americans we need to come together to build an America where no one needs to live in apprehension, discomfort or fear of the other. Blaming will not bring the lives back or solve the problems, pushing the bigots to the corner will not do it, engaging (there is no them, it is all of us) them in a normal day to day life has a chance of nurturing goodwill. A few great articles were written in commemorating this tragic event and here are the links for you to reflect upon. The Gurdwara handled and managed the event very well. I must appreciate every one of the Sikh community and certainly Brother Raj Bhandari and Dr. Harbans Lal (one of my favorite senior mentors) and several others for reaching out to people of different faiths and ethnicities. There are several, but I won’t be able to mention them all, however, I want to appreciate Sister Amina Rab for taking the initiative and doing extensive follow up to bring the Muslims community . Thanks to Raj for arranging a special room for prayers and arrangement of dates for Iftaar, it was super nice of them to do this. 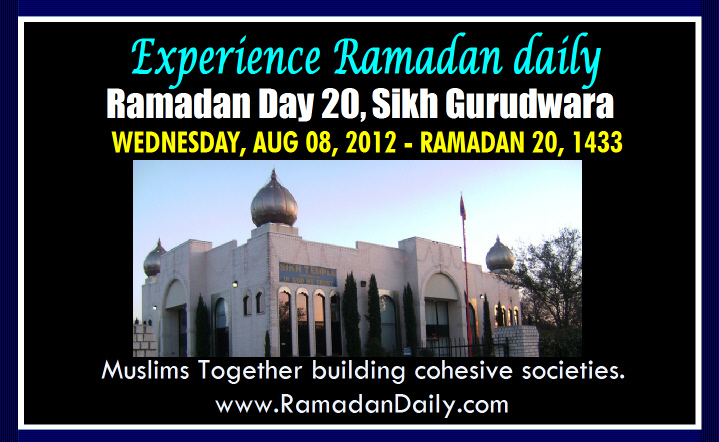 I have two reflective stories to share about the Sikh-Muslim relationship. 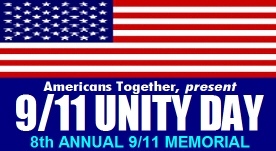 I have written the full version of the story; in short, our Sikh and Zoroastrian friends were offended at the first Unity day (9/11/2005) when Muslims walked out on them, when it was their turn to speak. Both the communities held that pain for two years, but thank God, we have great relationships with people of all faiths, and two years later in 2007 at Crowne Plaza Hotel, Dr. Harbans Lal and Dr. Firdosh Mehta shared their anguish with me and I couldn’t bear their pain and dug out for answers. Muslims did walk out on them. It was not because the Sikhs and Zoroastrian were speaking, but because it was the time for evening Prayers. Many a Muslims pray five times a day and on precise moments - for example today’s schedule is 5:34 AM, 1:45 PM, 5:30 PM, 8:19 PM and 10:00 PM. After hearing the reason, Dr. Lal and Dr. Mehta felt relieved and wished they had clarified this two years ago, instead of carrying it. Mayor Pat Evans and Daisy Khan were the speakers, and Mayor Evans said, I am perfectly alright if Muslim go to prayers, God is first. Dr. Harbans Lal, Dr. Mehta and I were relieved knowing the truth and communicate the same to the public. So, today, Dr. Lal and Raj Bhandari were fully aware that Muslims had to break the fast at 8:19 and were ready to tell the story. Most of the thirty some of us were sitting in the first four rows. On the other hand, what I admire about Brother Suleman, Imam Yahya, Brother Azhar Azeez and other leaders of the community was that they sat patiently beyond till 8:23, a window to go to do the Iftaar, and a room they had arranged to pray the Maghrib ( evening) prayers. The Iftaar was perfect - Lentil, Rice and Roti, all home cooked and delicious, and of course the Sevian (vermicelli) in the Shir Khurma (bioled in milk and sugar with nuts). 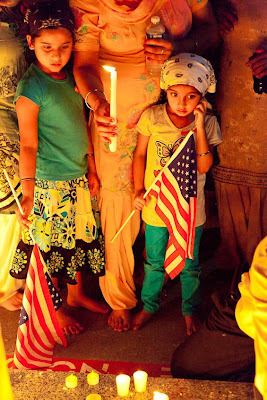 There are myths created about each other whether it is Hindu-Sikh, Jews-Muslim or any combination. Most of them go unquestioned for centuries, one such myth was King Aurangzeb's attitude towards Sikhs - based on misinterpreting a verse from Quraan and a word from Guruji Nanak. Dr. Dhaliwal of Nashville, Tennessee and I have cracked that myth after 350 years. It is historic. 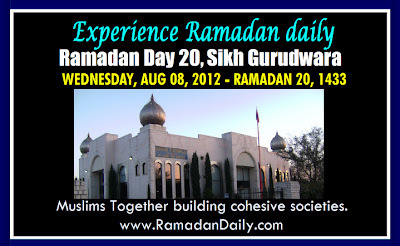 http://quraan-today.blogspot.com/2010/08/quraan-surah-hijr-1526-30.html as Ramadan proceeds, I will share similar stories with Jews, Christians, Hindus, Buddhists and others. This misunderstanding has played havoc during partition of India and Pakistan, the human brutality came to the fore - Sikhs-Muslims-Hindus have mercilessly slaughtered each other in the trains. We have to heal that, and the greatness to communities comes when they realize that their pain was as much as others pain. Neither Guru Nanak, Sri Krishna nor Prophet Muhammad authorized them to do that, it were ordinary men acted out of anger of displacement. No one needs to be blamed. Thank God, the process has begun, the Hindus and Sikhs have restored a few dilapidated mosques and turned them over to Muslims, and in Pakistan the Muslims have restored the Krishna Temple in Lahore and have maintained the birth place of Guru Nanank in Nankana. The good part of the above story is that many young Sikhs responded to my posting on facebook with, "where did this come from?" I am glad, the seniors had kept the difficult part of the history to themselves and did not pass it on to the youth, at least in America. Each mosque and each tradition is uniquely different. Insha Allah, I will do my best to keep that uniqueness intact, however, it is not easy to write different things each day for the whole month. If you wish to get a complete essence of this, please read for the whole month. Please visit www.RamadanDaily.com for a record since 2010. MikeGhouse is committed to building a Cohesive America and offers pluralistic solutions on issues of the day. He is a professional speaker, thinker and a writer on pluralism, politics, civic affairs, Islam, India, Israel, peace and justice. Mike is a frequent guest on Sean Hannity show on Fox TV, and a commentator on national radio networks, he contributes weekly to the Texas Faith Column at Dallas Morning News and regularly at Huffington post, and several other periodicals across the world. The blog www.TheGhousediary.comis updated daily.